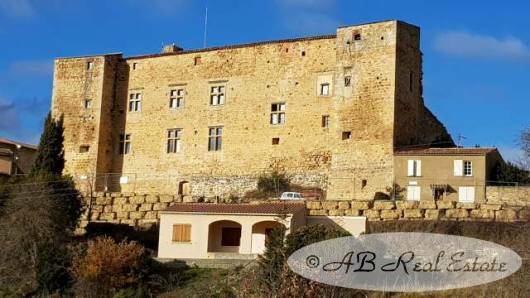 This majestic historic medieval Castle is dating from the 16th and 17th Centuries and offers today about 300m² of living area with another 600m² to be renovated. It is located on the edge of a hilltop village, in the greater Carcassonne area, known as the Cathar country, Languedoc Roussillon, Occitanie, South of France. It has kept much of its original character in tact and offers exceptional and rare architectural features of beauty. The current owners have made structural improvements, completely restored the west wing and great hall, and have installed central heating to the occupied part of the building. There are some very remarkable elements such as oubliettes, canonniers for muskets, a rare monumental staircase, and a garrison room etc. The attic lends itself to a stunning conversion with modern comforts and efficiency and staggering views. The current owners have produced on site replicas of original early 16th century doors and repaired some of the originals, always using locally sourced oak, cedar and chestnut wood. It is a listed building. The Castle, once restoration is finished, will offer around 900m² of living space on 3 levels with the possibility to convert or rebuild more space. Today there is about 300m² of living space meticulously renovated respecting the history and character of the property. The east wing has interesting possibilities as a modern renovation project. Ground floor: A monumental stone stairway leads from the entry hall to a landing with a south facing Renaissance window with original slab paving. Through a chestnut door on the left is the soldiers room. The soldiers room has a door that leads to the porch of the east wing and another door leading to a corridor and landing leading to the cellar staircase. To the right of the entry hall through an oak door is the Great Hall with a very high 'plafond à la française, monumental fireplace and under floor heating. To the west of the great hall is the kitchen with an original stone sink, a new plafond à la française made with local cedar. Another entry door leads in to the kitchen coming in from the western porch. The two south west tower rooms consist of a pantry and a WC, each with an oubliette and their oak and forged iron covers. There are two original built in stone cupboards in the kitchen and one in the pantry. 1st floor: Leading to the left of the main staircase is the upper great hall and to the east and south facing 'summer bedroom. The summer bedroom has a door leading to an upper level of the east wing where there is an ancient latrine. There are two south east tower rooms that were used as a Garderobe and a servants quarter and still have many original 16th century features. The Upper great hall leads to the second level of the fully renovated west tower. There is a living room with a monumental fireplace. The living room leads to the study that has a custom built oak library and a cedar mezzanine. Windows look over the entry to the east, over the courtyard and the far reaching county side view, to the west with views over the village and nearby hills. The south west tower rooms of the first floor serve as a childs bedroom and a shower room which has an original built in stone cupboard. A steel staircase with old oak treads provides a secondary access to the second floor. 2nd floor: Continuing up the original stone monumental staircase there is a landing and then another over the entry door. Here there is an impressive view to the north. Behind is a very curious room with a dedicated fireplace of great historical interest and the traces of an older 'plafond à la française and gessoed wall. It was believed that this floor served as a retreat room with clues to the emergence of the humanist tradition. The top floor is an attic with still enough height and 5 separate defined areas. This floor could be converted perfectly into comfortable apartments with good insulation and modern comforts. One can clearly see the roof from this level. The chateau originally had a hip roof which was altered in the 1970s. The current owners intended to restore this hip roof. Architectural drawings will be provided. The roof of the south east tower will be properly restored to an open air 'guette. Basement: The vaulted cellar has a separate wine cellar area, a heating room and a large area with the floor in terra cotta and lime walls with chestnut and oak doors and window frames made to high specifications on site. The grounds total 2154m² and include a formal north terrace, a west terrace, a large paved courtyard suitable for receptions and an east garden with three terraces. The first is a herb and vegetable garden, the second a lawn and the third has four raised stone beds. The views from the gardens encompass north, east and south across forests and the Pyrenees Mountains. The major structural works including roof over the uninhabited part of the chateau need to be completed. The windows and doors that have been replaced are executed to an extremely high standard of craftsmanship and include leaded and stained glass. Six of the seven monumental fireplaces have been repaired. The Chateau is connected to the mains village water and sewage and has a subterranean gas tank on site. The central heating has a wood and a gas boiler. This is a unique opportunity to continue a quality renovation of a historic Castle in a region steeped in history, culture and a well known destination for nature lovers. It is set in an exquisite landscape and although deeply rural is within an easy drive of major French and Spanish cities, airports and Andorra. It benefits from the good food and beauty of Frances Provence but has not lost its authenticity. The department of the Aude is famous in France for its unspoiled and majestic countryside.